If you love singing and performing, you’ll love the typical activities of a Songs of Hope™ day because virtually every day has some form of art in it. 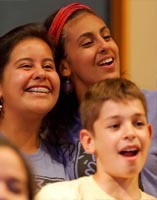 There are two halves to Songs of Hope™, the 3-week rehearsal period and the 3-week performance period. During the first three weeks, when Hopers™ are in rehearsals, your day starts with a buffet breakfast. There’s no reveille, no wake-up bells. You can get up really early if you’re a morning person or you can sleep a bit later, so long as you get to rehearsal on time, washed and fed! You start with a vocal rehearsal led by one of our lively and talented vocal directors carefully selected for the current year's program. You learn songs from countries all over the world. You learn cool medleys of rock & roll, rap, jazz, blues, traditional folk, and reggae. In dance rehearsals after lunch, you start putting movements and dances to songs. You begin learning how to be a more energetic and more dynamic performer. You will learn to perform to rhythms from many countries. Rehearsals are all about getting the concert ready for tour! After rehearsals, there’s dinner followed by more free time and fun activities and games. You might learn a cool game from one of your new African or Asian friends. You might draw and share images of your countries with other Hopers™. You might watch a DVD of a past Songs of Hope™ concert for artistic inspiration. When rehearsals are over and Songs of Hope™ goes on tour, the days change. There’s now more time for play and fun. When we're performing near home, you'll have all kinds of outings and activities. When Songs of Hope™ tours overnight, you might perform some small concerts in local nursing homes, and your full-length public concerts in city parks. You might go swimming in a city pool or a local lake. You might go hiking in a nearby National Park.